LED dog collars have been designed to help improve dog’s safety. However, the huge demand for lighted led collars have led to mushrooming of many companies each claiming to produce the best LED collars for dogs. As a result, many people are usually confused on which option to choose. So, are you considering buying a lighted dog collar for your pet but you are wondering the features to look when shopping for one? If so, then you have just landed in the right place because in this article, we are going to give you proven tips to help you get value for your money when buying LED lighted dog collar for your pet. Buy an LED dog collar that not only fits well but one that has excellent comfort features. You will only have fun with your dog if it is comfortable wearing the collar. Take your time and check if the collar is equipped with protective outer cover made from soft material to help make your dog comfortable. The collar should also be easy to use. No one want to fight with their dog just to put on the collar. One of the main functions of good light up dog collars is protect the dog when it is out in the open. For instance, when walking with your dog during cold winter season, the collar should help improve is visibility reducing the risk of potential collisions because the dog can be seen by other dog walker, motorists and runners from a distance. When choosing an LED dog collar, you should not comprise on its safety feature. Ensure that it is equipped with all necessary safety features needed to keep your dog safe especially in the dark. 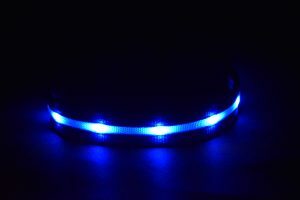 The LED dog collar should have excellent visibility features. In fact, this is the main reason why many dog owners buy this product. The collar should be visible enough so that motorist, pedestrians and other dog walkers can see it from a distance. This will go a long way in helping to prevent accidents that can injure your dog. The collars visibility should be bright enough so that your dog can be seen even during harsh weather, such as fog, rain, or snow. Some LED collars use the latest technology that include the use of rechargeable USB lithium –ION battery that provides excellent battery life performance. This feature is very important because it will help your dog to stay illuminated and safe for long period of time. In addition to that, this battery uses special technology that enables them to be recharged faster using devices such as laptops, tablets, phone charger, game consoles among many others giving you the convenience that you need. Remember to always check out Yippr Rechargeable Dog Collars and Leashes anytime you want to save money on batteries. When you choose an LED dog collar with rechargeable batteries, you will not only have an eco-friendly dog collar but you will also not have to worry about using your hard-earned cash to buy batteries. Buy a LED dog collar that can work well regardless of the weather condition. It should have excellent waterproof features. In addition to that, it should have rust proof components to protect crucial parts from wearing out. When we are traveling or out walking with your dog’s safety is always a concern. Not only the visibility factor but keeping your dog hydrated has to be top on your list. 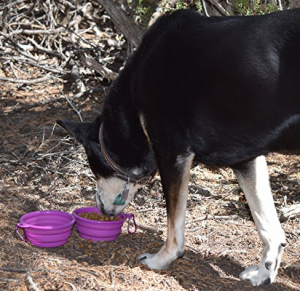 Yippr has collapsible pet travel bowls that are awesome and do not take up much room. You can easily clip a bowl or two to your belt loop with the handy carabiner clip that is included with each bowl. If you travel to dog parks or walking paths you may also be interested in protecting your automobile seats. One of the heavy duty protective dog car seat covers will protect your cloth or leather seats from scratches, dirt, mud and water. These seat protectors are non-slip and comfortable for your dogs.